Make your daily life easier with the TP-Link Kasa Smart Wi-Fi Plug HS105. Give any device smart capabilties when you plug into this wifi smart plug. You'll be able to control it from your smartphone or a compatible voice assistant. You can also set a schedule so your devices work with your routine. Integrate traditional devices like standing lamps and coffee machines into your smart home network and control them using the Google Home Hub, Google's newest smart speaker that boasts a 7 inch touchscreen display. With the Google Home Hub and free TP-Link Kasa Smart WiFi Plug (2-pack Mini) bundle, creating your own smart home has never been so easy. Gives "dumb" devices like coffee machines, fans, or lamps smart features and control them using the Google Home Hub. The Hub gives you full control over all your connected devices and lets you stream music and video, get weather and traffic updates, and more. "Home View" controls: Using the "Home View" dashboard on the Google Home Hub, you'll be able to access and control all your connected devices from one place. You can also group your devices into separate rooms for more targeted control. Create scenes to engage multiple devices at once at specific times. 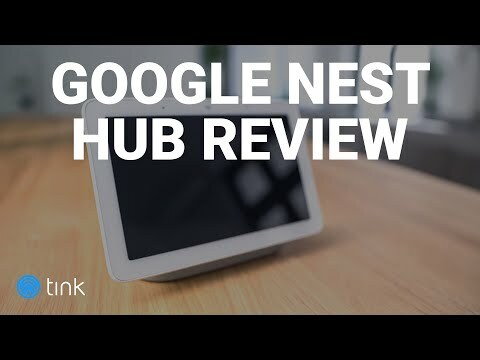 Music and video streaming: The Google Home Hub supports multiple streaming services such as Youtube, Netflix, Spotify, and Google Podcasts. Voice control Use the Hub's built-in Google Assistant to control your connected devices using your voice. "Voice Match" technology allows the Hub to recognize different voices and gives tailored responses to the person speaking. Control from anywhere: You'll be able to control devices plugged into the TP-Link Kasa Smart WiFi Plugs from anywhere with an internet connection using your smartphone. For example, if you forgot to turn off your plugged-in lamp before leaving for work, you can do so from the Kasa Smart app on your mobile device. Give your "dumb devices" smart features by plugging them into the TP-Link Kasa Smart WiFi Plugs. After the initial set-up, you'll be able to control them using the Google Home Hub, the smart speaker with the built in Google Assistant. The Hub also lets you stream music and video, get weather and traffic updates, and more. Small enough to fit on countertops or bed-side tables, the Google Home Hub is the powerful smart home controller that also helps create a lovely home atmosphere. The Hub even works as a digital picture frame to show off the latest photos you've taken on your smartphone. Its Ambient EQ technology means it can adjust the display's brightness based on daytime sunlight or home lighting. The screen can be dimmed at night-time for a good night's sleep. Using smart plugs makes it easy to experience smart home functionality without upgrading all of your old devices. Take basic smart home features to the next level by integrating the TP-Link Kasa Smart WiFi Plugs with the Google Home Hub. The devices are easy to set up and integrate with one another. Constructed using high-quality hardware and software, these devices work together seamlessly. The app gives you tips on how to get the most out of your device, while also you giving a general breakdown of the various smart home devices and other services compatible with the device. The Hub brings a visual dimension to the traditional smart speaker, allowing you to control all your connected devices from one interface and stream music and video. We experienced no delays when making voice commands or creating schedules and scenes. Both the Hub and smart plugs are sleek and compact, so they will easily fit in small spaces. The Hub has a privacy switch to turn off the microphone and stop it from listening for the wake word "OK, Google". A great deal for anyone interested in entering the smart home world and giving their "dumb" devices smart features. I am interested in purchasing further smart home devices. Which brands are compatible with the Google Home Hub? The Google Home Hub is compatible with many smart home brands, including Philips Hue, TP-Link, and August Home. Does the Google Home Hub offer parental controls? Yes, the Hub offers parental controls which can be used to block explicit content. Does the Google Home Hub have a camera? No, the Hub does not have a built-in camera.